You can’t fly in or out of England today. Or much of Europe for that matter. And maybe not for a few days, or even weeks. No one’s sure right now. What is certain is that it’s one of the most disruptive events in the recent history of air travel. 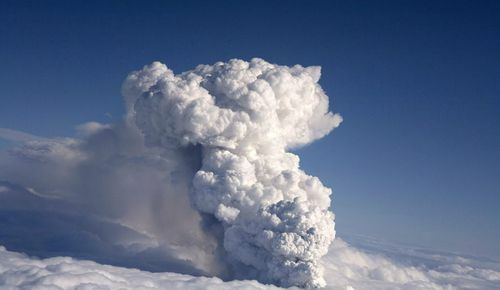 So much ash is being dispersed into the atmosphere from a major volcanic eruption in the Eyjafjallajoekull region in Iceland that all major airports in Britain are shut tight this morning; Heathrow, Glasgow, Edinburgh, Aberdeen, Newcastle and Belfast, Northern Ireland. Airport shutdowns and cancellations have also spread into Belgium, the Netherlands, Denmark, Sweden, Finland, Switzerland and France. Not only does the ash affect visibility, but tiny dust particles can work their way menacingly into jet engines. How long the airport shutdowns last will be determined by the weather and wind patterns. But Wait- There’s More; Balls of Fire! Residents of the Midwest were startled to see and hear a rather ferocious fireball or meteor or something last night. It appears to have triggered a sonic boom. You can see a video loop of it as it explodes and the remnants appear to fall to earth here and here. The first video was taken from a dashboard camera in a cop car in Iowa that happened to be pointed in the right direction. The second one is from a University of Wisconsin-Madison webcam. Residents of Missouri and Illinois also reported seeing it. Considering all the earthquakes and now volcanoes and meteors/fireballs that are affecting the planet in one form or another this week, as a public service, Garciamedialife remains on the lookout for any reports of massive swarms of insects headed toward Jerusalem. I’m so glad I didn’t have to pronounce “Eyjafjallajoekull” ! So funny you should say that. I initially put the pronouncer into the post…then realized it made the sentence ten feet wide so I said, “screw it.” I do believe I used that word once when I hit my thumb with a hammer. The Economic “Recovery” Who, Exactly, is Watching Larry King?